We prepared especially for you the unique Moving House Guide to make your removal easier and less stressful. Follow these steps and we promise that moving your house won’t scare you anymore. We can all agree – Moving a house can be one of the most stressful and the most challenging activities you do in life due to the sheer amount of different tasks you have to complete in a specific time. But relax, we know the best tricks and tips on moving a house and we share them with you in the article below. 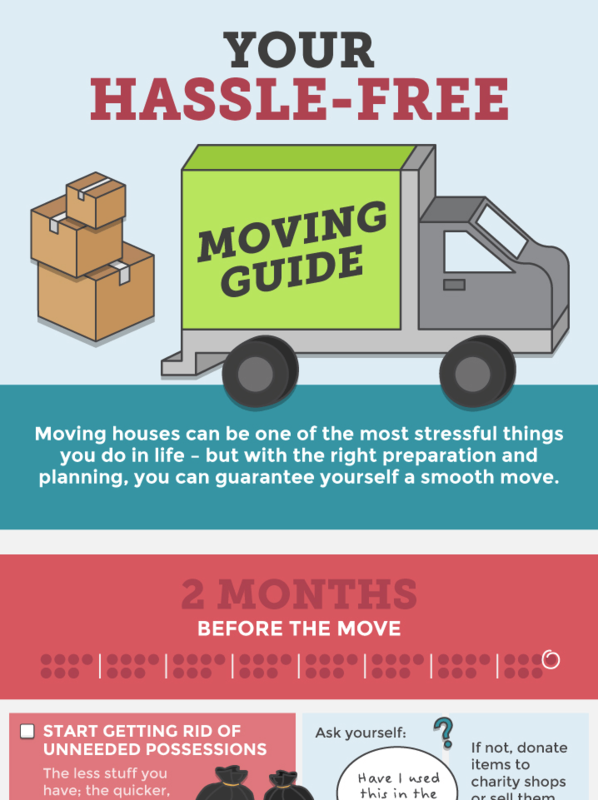 Also, check the infographic prepared by Secure Move Services. It shows step by step essential things needed to be done before the removal. We recommended printing the below infographic off to utilize the tick boxes. First, research the local removal companies and choose the one with affordable prices. Remember that the more boxes, furniture and things to pack and carry, the more the removal will cost you. If you plan to transport everything by yourself, find a company where you can get a big enough transport for your needs. Things which had been used a few years ago, won’t probably be used anymore in your life. It’s simple, there are people who may need those things more than you. Donate the items to the local charity shop or ask your friends if they need any of your belongings. A removal is a very good opportunity to get rid of needless stuff and to take to your new home only the items you really use. Moving a house is the best chance for decluttering and cleaning. 4 weeks before the removal you can start packing items like books, candles, frames with photographs, small lamps, rugs, decorations etc. Remember about the boxes. You need to prepare the boxes before the removal will start. It’s also significant to ask some friends or family to help you with everything if you don’t decide to hire a removal company. Few days before the removal, start emptying and defrosting your fridge. Don’t buy any more food, eat all the food you have already bought. Also, start packing clothes, crockery, cutlery etc. On the day of the removal check if everything has been packed, and iif the boxes are safely secured. Remember about the key to your new house. Follow these steps to reduce the stress of moving your house. We guarantee that these tips are extremely helpful and will make the removal much easier. Secure Move had created an infographic to help people plan their move better, giving a timeline of when certain tasks should be completed. We recommended printing the graphic off to utilise the tick boxes. Stick it on your fridge an work your way down the list as moving time gets closer.